Alpha Platforms' fleet of truck mounted aerial lifts is the most extensive in North America, ranging from 65 to 230 feet in height reach and as much as 115 feet in side reach. The flexibility, productivity and capabilities of our platforms far surpass regular booms. 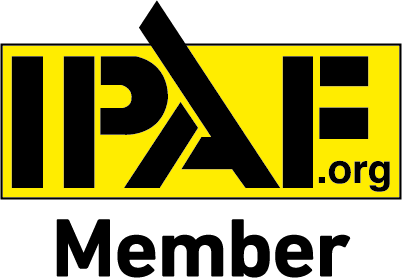 Alpha Platforms is an official IPAF training and certification center. 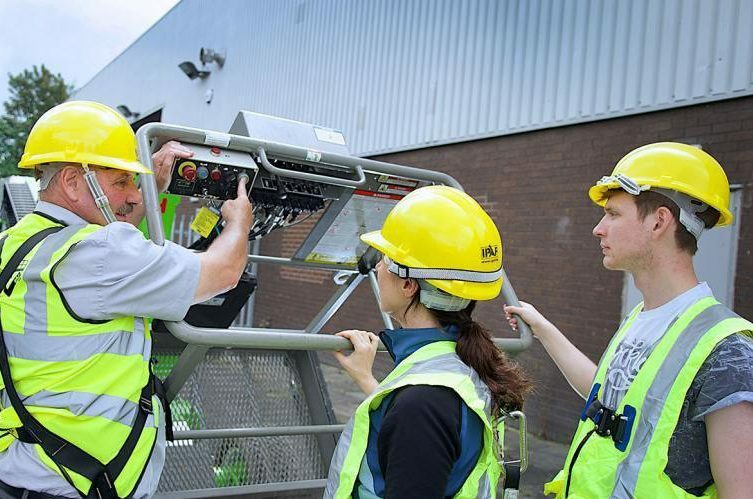 We provide training and certification for all categories of aerial work platforms users. Alpha Platforms provides extreme reach aerial work platforms for many different applications. The vast capabilities of the aerial lifts make them an essential tool in many industries, including glazing, roofing, inspections, inspections and many more. Not sure which solution fits your business needs? Give us a call, and we will answer all of your questions. New York window cleaning requires a variety of machinery. While rope descent systems and scaffolding may help workers do their jobs, spider lifts and truck-mounted aerial platforms can make their work much easier. Numerous high-rise buildings with hard-to-reach spots make it virtually impossible for the window cleaners to succeed without proper equipment. Just as NY window cleaning, construction and repair work in NY and the area requires a careful approach to choosing the right tools. The majority of the construction projects are formidable, time-consuming, and costly. Investing in purchasing height-access equipment can substantially reduce the revenue. That’s where Alpha Platforms come in. We offer all types of businesses an impressive variety of aerial machinery for rent. We are the only company in the area, which is ready to satisfy your high-rise requirements without substantially hurting the budget. We know all too well that each project may require several pieces of equipment. Purchasing them is not possible for the majority of small companies. That’s why we offer NY lift rental to anyone with a height-related project in mind. At Alpha Platforms, we make sure you can proceed with your task without looking back at the equipment expenses. 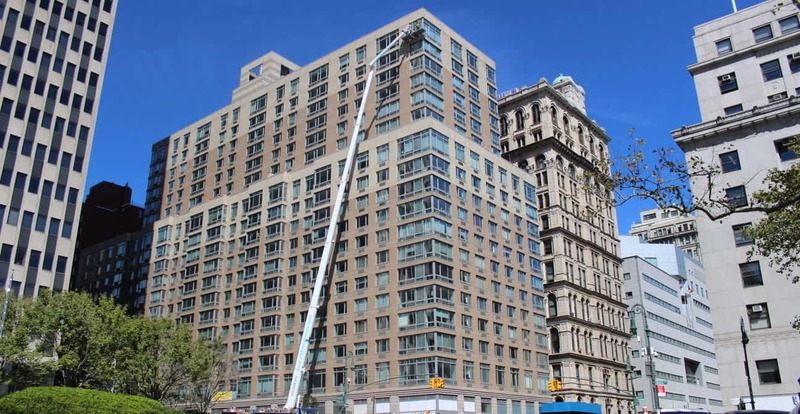 Window cleaning NYC companies, as well as numerous construction businesses, have been taking advantage of our services for several years. The benefits of renting equipment for work at heights are numerous. Lift rental allows you not to worry about maintenance, which is costly. Large aerial machines require constant servicing. In case they break down, the repair may take a substantial amount of time while hurting the budget. Spider lifts, truck mounts, and other equipment needs large storage space. When not in use, the machines still need to be maintained. Storage expenses are formidable and unnecessary for companies, which need these machines several times a year. Another thing to consider when comparing rental to ownership is transportation. 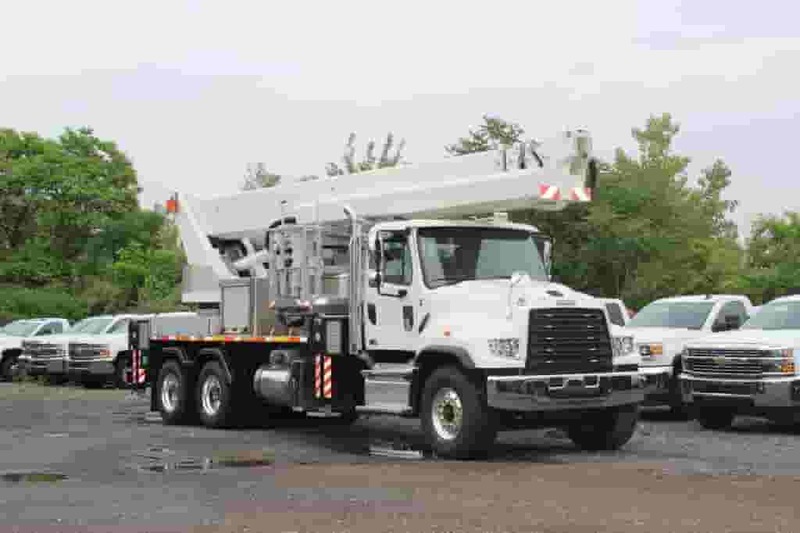 Transporting the truck-mounted aerial work platforms NY can be a costly endeavor. It’s especially tough when you are working on several projects simultaneously. That’s why rental is an optimal solution for many companies. At Alpha Platforms, we take the responsibility for keeping all our height-access equipment in top shape. We are always ready to provide the machines to our clients upon request. Lift rental NY is convenient, cost-efficient, and demanded. We take the needs of all our clients into consideration when purchasing new equipment for their use. The opportunity to rent the machines you need for a project of any size gives numerous NY companies a peace of mind. We are always ready to provide the necessary truck-mounted aerial work platform New York. Each platform and height-access equipment requires a professional operation. We have a team of experts ready to help you take advantage of the most complicated height-access machinery regardless of the project’s complexity. For example, window cleaning Manhattan often requires access to the middle floors of high-rise buildings. Dealing with them without proper equipment is impossible. Operating the aerial work platforms Manhattan without experience is complicated and time-consuming. We suggest hiring one of our operators to make sure you get the job done quickly and efficiently. At Alpha Platforms, we offer unique New York lift rental services to help numerous industries get their projects done on time. Whether you need a boom lift NY or looking for other height-access equipment, you can get it as quickly as possible by placing an order. Truck-mounted aerial work platforms New York are expensive, hard to store, and require special operation skills. By taking advantage of our services, you don’t need to worry about any of the above. We make sure all our clients are satisfied with the options we offer. At Alpha Platforms, we focus on keeping our clients happy while going easy on their budgets. We help the client go through the rental procedure as quickly as possible. On the day of the rental, we deliver the height-access equipment to the site at a scheduled time in order not to delay your work. Upon the project completion, we take the equipment back to our facilities. 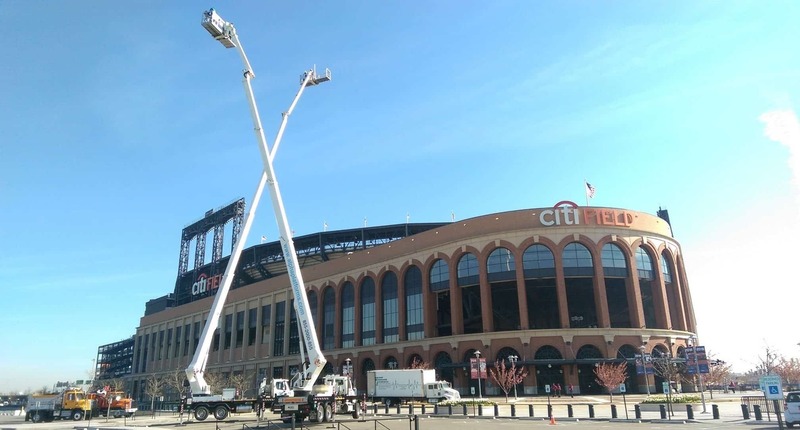 Our clients don’t have to worry about keeping the boom lifts New York in top shape. They get high-quality finely tuned equipment at a scheduled time. In case you need several pieces of machinery for your project, we are happy to satisfy your requirements. All of them will be prepared and delivered to the site. At Alpha, we have a large fleet of height-access equipment including truck-mounted aerial platforms, book lifts, spider lifts, and much more. Our machines can reach the height of 230 feet. We know that height isn’t the only problem window cleaning, construction, and other height-related businesses face. They have to deal with hard-to-reach spots, narrow spaces, and uneven terrain. That’s why we have a wide variety of spider lifts to choose from. We are the only lift rental New York to offer you such an array of services. We care about the needs of our clients and take care of numerous expenses that have to do with height access. Our truck-mounted aerial work platforms NYC allow you to complete numerous projects as fast as possible. It takes only 10 minutes to set up the platform and extend it to 230 feet. If you need to take care of a less formidable height, we have other options available. Our truck-mounted platforms range from 65 to 230 feet. This variety can take care of virtually any project our clients can come up with. Lift rental Manhattan can save you time, money, and effort. We are the only company in New York to provide such rental services. Instead of wasting your money on purchasing expensive height-access equipment, which you may only need to use once a year, take advantage of our rental options. Height-access equipment is complex. It requires regular maintenance and servicing. At Alpha Platforms, we make sure our aerial lifts and platforms are in their top shape to be available for our clients’ needs at any time. We have many years of experience working with such equipment. At Alpha, we pay special attention to keeping our fleet up to date. As soon as new height-access technologies appear on the market, we make it our goal to incorporate them into our equipment. We try not to stick to the “old and tried” ways. We take advantage of the latest information and machines to make sure our fleet is the most advanced in the country. In case you aren’t sure what type of equipment you may need for your project, our experts are always ready to provide an extensive consultation. We have experience dealing with all types of height-access projects in New York. 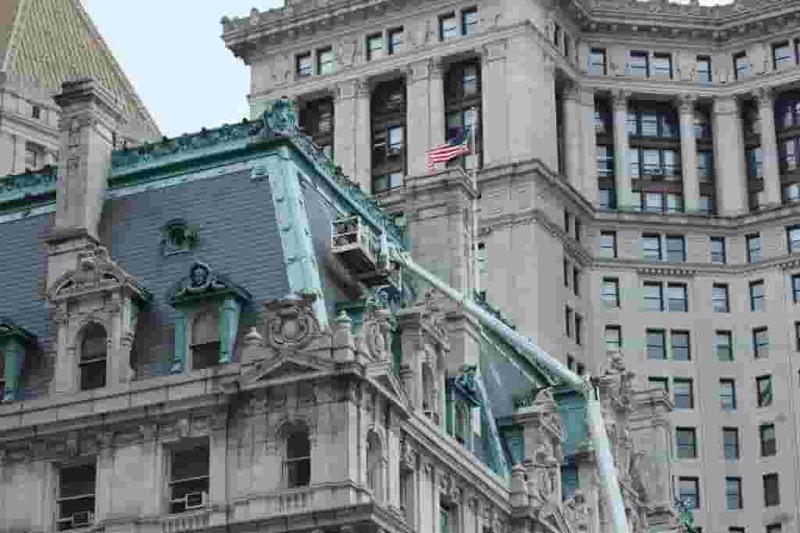 We know which equipment is the most suitable for window cleaning, construction, tree cutting, façade repair, and more. Our specialists are available all year round to give advice and schedule equipment rental for our clients. We have an excellent reputation as a respectable lift rental company in New York. We work hard to uphold it. When you rent one of our lifts, you don’t have to worry about bringing it to the site, setting it up, dealing with the traffic, losing off the street or dealing with Department of Transportation. We take all of it upon ourselves. All you need to do is choose the equipment and schedule the rental date. Once the project is completed, you don’t have to deal with removing the equipment. It’s our job. If you want to save time, money, effort, and nerves while working at heights, we suggest you consider one of our rental options today. Aerial Access Equipment Rental. In a large city like New York, looking for height access experts is hard enough. Finding height-access equipment for rent is almost impossible. Alpha Platforms was created to satisfy the needs of numerous companies, which didn’t have the budget to purchase expensive machinery. More often than not rental is a more cost-efficient way to deal with the project than the purchase. 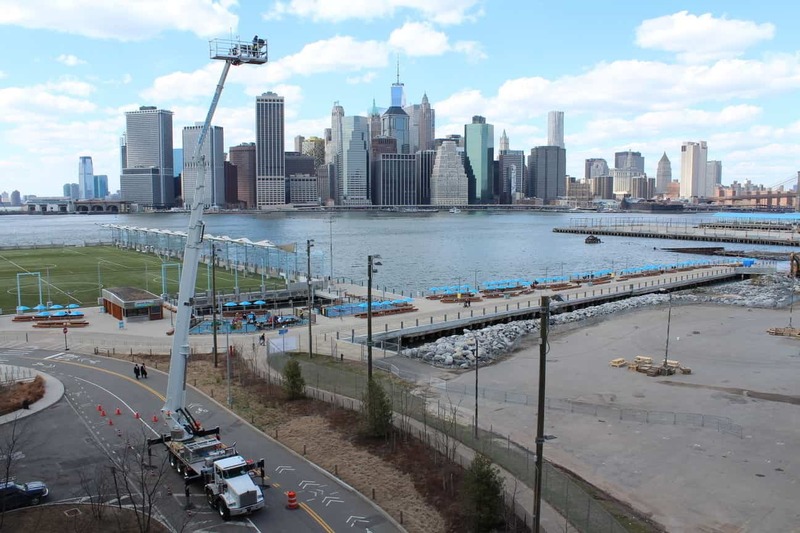 At Alpha Platforms, we’ve considered all the expenses necessary to maintain high-quality height-access equipment and made a decision to help New York companies in their quest to speed up the project execution without substantially hurting the budget. The amount of time and effort our specialists are putting into keeping the fleet updated is immense. We work hard to cater to our clients’ every need regardless of their niche. Window cleaners, construction workers, tree cutters, façade repair workers, and more have different needs and budgets. In our fleet, we can easily find the right equipment for any task. We know that some projects require several different machines. At Alpha Platforms, we are ready to prove spider lifts, boom lifts, truck-mounted platforms, and much more either separately or together with another machine. Handling height-access equipment requires many skills and experience. That’s why our team of operators is always ready to help you deal with the lifts and platforms. Our clients don’t have to worry about setting them up or handling the complicated controls. They can do their job without looking back at the technical part. We strongly recommend taking advantage of one of our operators since they have been working with this equipment for years. Our certified specialists can make sure the project is done on time reducing many unexpected expenses. Inexperienced operators may not just delay the deadline but endanger the workers. At the same time, they can damage the expensive equipment, leading to costly repairs. Another team of our experts takes care of the equipment maintenance. In order to work properly, height-access equipment must be serviced on a regular basis. The more complicated the machines become, allowing workers to reach higher spots, the more care they need. We know all our equipment requirements and make sure they never let our clients down. At Alpha Platforms, we know the importance of a met deadline. We never allow broken or malfunctioning equipment to leave the storage facility. Height-access equipment doesn’t just help our clients speed up their work process. It takes care of their safety. Ladders, scaffolding, and rope descent systems can’t beat the safety of the aerial equipment we offer for rent. While giving the workers more freedom of movement, it keeps them protected from many accidents. Our equipment is not just safe and convenient; it gives workers the room to maneuver. It allows bringing all necessary tools to any height instead of choosing which ones the workers can lift and handle. Truck-mounted platforms are an excellent choice for workers in need of extra tools. Spider and boom lifts allow them to stay safe while reaching tough spots. At Alpha Platforms, we care about your business and budget. We are always glad to give extensive consultations to our existing and potential clients. Aerial Access Equipment Rental. Height-access equipment rental has become one of the most demanded services in New York and the area. Today, the majority of construction projects involve reaching certain heights. That’s why the cost of such projects goes up substantially. The price of height-access machines is high and factoring it into the final cost can change the picture. The situation becomes different when the rental option comes in. At Alpha Platforms, we allow our clients to choose among many different types of equipment for their needs. The machines are always available at a fair price. We know how complicated some projects are. They require a special approach. That’s why our fleet features truck-mounted aerial platforms. All the platforms stand on the all-wheel drive and rough terrain chassis. They are ready to work in all types of environments in and around the city. We make it our goal to help clients reach new heights. That’s why all our equipment works to its maximum extent. The truck-mounted aerial platforms can reach as high as 300 feet. This means they can work with buildings, which are more than 25 stories high. Our clients are very different. We work with contractors, window washers, branch cutters, and more. When New York companies find out about our existence, they thank us for the wonderful idea of helping them cut the costs. We don’t just offer you a wide choice of machinery, we take excellent care of our equipment. All the machines are serviced on a regular basis. When you call us to book a piece of equipment, you can be sure you are getting the best of the best. While maintaining such fleet of equipment is expensive, we don’t opt out of even the smallest check-ups. It’s highly important for us to bring our clients excellent equipment. In fact, you don’t have to think about transportation. We worked out our special transportation means for all our machines. All you need to do is tell us when and where your work site is and what equipment you need there. We will arrange the delivery on time and remove the machine when it’s no longer needed. We have a large team of specialists servicing and operating the height-access equipment. From boom and spider lifts to large truck-mounted platforms, we have them all covered. At Alpha Platforms, we have years of experience providing services to the clients working with heights. If you’ve never rented a height-access equipment before and can’t tell which one should suit your project best, give us a call. We can offer you a wide choice of options. If you need more than one piece of equipment, no problem. We will deliver as many as you need on the chosen date. We suggest you get in touch with one of our specialists to discuss the details of height-access equipment rental. We are always ready to answer all of your questions about our services and each machine in particular. Don’t hesitate to make your project more cost-efficient. Give us a call today. Less..
I’ve been happy with the services provided by Alpha Platforms. They have been wonderful!They returned my calls quickly, and answered all my questions. 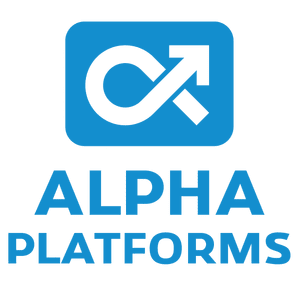 I have always received good service from Alpha Platforms. Timing and quality have always met my expectations and everything is communicated in a professional and timely manner. Lou Chan CEO Chan General Contractors Inc. I love the new 230′ platforms. They save me a lot of time during inspections. Now I am able to accomplish in a day what I previously had to spend three days on. Lift Rental New York the best service!